According to Nettle and Romaine in the article“Preserving Endangered Languages”, 90% of the world’s languages are expected to disappear in the next 100 years. S-DELI saw the need to document the indigenous Nigerian sign language in order to develop and preserve it as well as promote deaf literacy. The documentation includes anything indigenous, cultural heritage inclusive. 1. 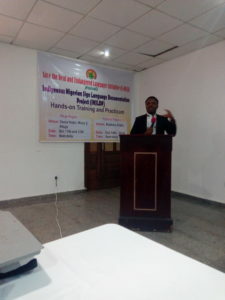 “Principles and Practices of Signed Language Documentation” by Dr. Emmanuel Asonye, President, S-DELI. 2. “Tools for Documenting Signed Languages” by Aniefon Daniel Akpan, Head of Research, S-DELI. 3. 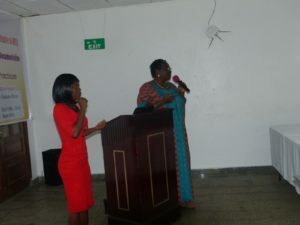 “Documentation of the cultural Heritage of Nigerian Deaf” byProf. 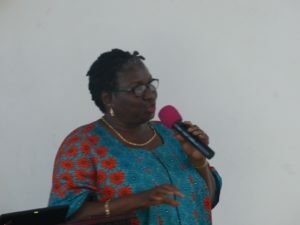 Imelda Udo, Department of Linguistics and Nigerian Language, University of Uyo, Akwa-Ibom State. 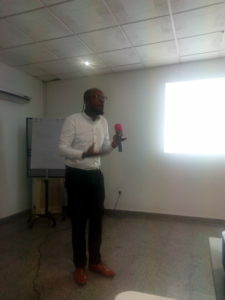 In his lecture, Dr. Emmanuel Asonye explained why we document, what to document, how to document and who to document. 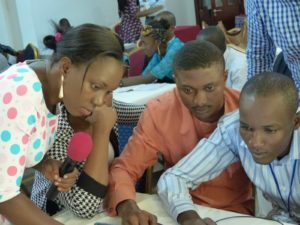 We document because we want to develop and preserve the indigenous Nigerian Signed Language and also to promote deaf literacy. We seek to document anything and everything indigenous to deaf people that includes but not limited to deaf cultural heritage, indigenous signs not used in schools for the deaf as deaf schools teach signed version of spoken English. The documentation project is to be carried out, by collection of videos, still pictures, data and metadata. The above listed shall be analyzed using ELAN, Audacity and Handbrake. Before documentation, team members have to be fully prepared, funds, equipment, accessories, consent, approval wordlist, pictures and graphics should all be readily available. During the documentation, technical assistants and language consultants have to be on ground and after documentation, the collected data shall be stored, transferred, transcribed using technological innovation. For the purpose of this documentation project, Eudico Language Annotator (ELAN) developed at Max Planck Institute is to be used.It is most appropriate for Sign Language Documentation because it contains both audio and video features, more so it is used for adding detailed information to the documentation. Team members installed ELAN on their PC’s. To annotate files on ELAN, two files are required namely; video file (mpg,mpeg) and an audio file (wav). 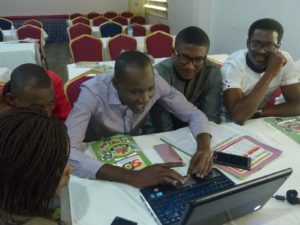 At the end of the theoretical section, team members did a practical section on how to use ELAN, Audacity and Handbrake. 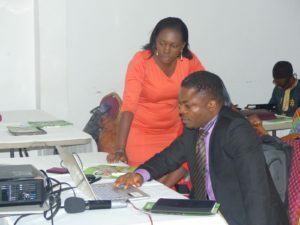 Professor Imelda Udoh from the department of linguistics and Nigerian Languages University of uyo explained the techniques of gathering data. This technique includes observations, interviews (which may be structured or unstructured), intuitive knowledge, recording (audio and video), pictures, questionnaires etc. The data to be collected may be in form of audio, video, pictures, text, descriptive resources and Meta data. Documentation procedures are in 3 stages and they include:pre-documentation, actual documentationand post documentation. Pre-documentation process involves contactingthe language community and seeking approval to the documentation. During a pre-documentation plan, budget plans is drawn up including gifts to the community and also make provision for accommodation and health issues. Equipment to be used (Audio recorders, video recorders, microphone, still cameras, tripod stand), wordlist, etc. need to be checked to ensure they are in good working condition. In actual documentation you set up your equipment, words should be pronounced multiple times, do a mock recording and then the actual recording. During indoor recording minimize as much noise as possible; do not record close to the door or window, also put off the television, radio, handset, refrigerator, air condition, fan etc.In outdoor recording you record during early or late hours, do not record close to the clinic to avoid siren, the purpose of your recording will determine the kind of equipment to be used. 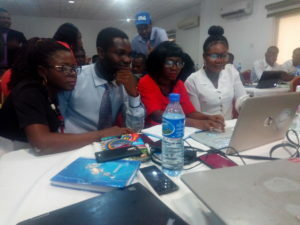 During post documentation, collected files uploaded on the computer and the files are backed up, mix the video files, listen to the recording to ensure if editing is necessary, analyze data then put data in archive. They include orthographic, phonemic, phonetic, prosodic, Para linguistics and non-linguistics. Translation depends on the purpose of documentation and the audience; the tiers of translation include; literal translation and free translation. Data processing grammatical annotation include interlinear glossing and grammatical notes, grammatical note highlights problematic grammatical feature. Archiving can be done digitally or with analogue such that materials are deposited in physical and technological repositories such as ELAR, DOBES, etc. 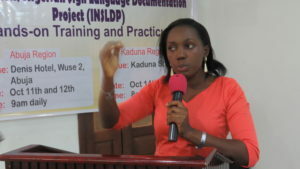 STRATEGIC ADVOCACY IN A SIGNED LANGUAGE COMMUNITY, THE CASE OF DEAF IN NIGERIA. 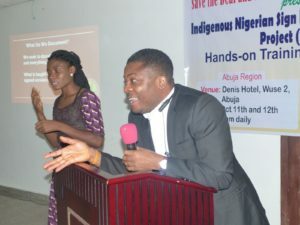 In his lecture, Mr. OnumaraOnyeka, Head of Advocacy and Outreach explained advocacy as it relates with deaf in Nigeria. Advocacy is an activity by an individual or group which aims to influence decision within political, economic and social systems and institutions.It involves getting government, business, schools or other large institutions to correct an unfair or harmful situation affecting people in a community. This can be achieved through activities like: media campaign, public speaking, commissioning and publishing research or conducting exit poll, etc.Lobbying is also a form of advocacy where the direct approach is made to legislators on an issue which plays a significant role in modern politics. 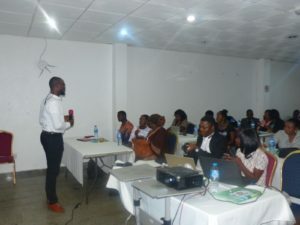 The rightness of the cause, the power of the advocates, the thoroughness with which the advocate researched the issue, the opposition and the climate of opinions about the issue in a community, the skill in using the advocacy tool available which include social media. In order to be able to advocate effectively, understand the issue thoroughly, recognize the allies, Identify the opponents and resistance, encouraging the involvement of potential opponents as well as allies, develop a plan for advocacy then do a proper documentation and accountability. S- DELI is a research based nongovernmental organization documenting the indigenous sign language and the deaf population. Deaf children are linguistically and culturally marginalized and do not attain linguistic and cognitive competence due to the absence of indigenous sign language for deaf education. 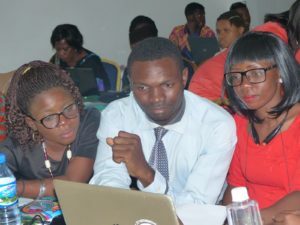 S-deli seeks to document the Nigerian sign language and train deaf and hearing individual on the principles and practice of signed language linguistics. Sign language documentation, advocacy for the mainstreaming of the deaf community, advocacy for early childhood screening, advocacy for girl child, advocacy for sexual reproductive health rights, advocacy for better access to health care. Advocacy is an exciting work because one gets the pleasure of fighting the good fight and sometimes the thrills of victory.